Welcome to the Lori Anderson’s (http://www.prettythingsblog.com) 9th Bead Soup Blog Party. 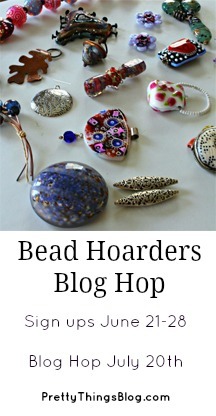 Everyone I know who loves beads hoards them and we were supposed to send our partner beads that had some meaning to us. My partner, Jenny Kyrlach (http://anafiassa.blogspot.com), sent me the first art bead she ever bought in 2015 made by Andrea Pirkey along with some paper beads she made and some gemstones. I ended up not using the amethyst and rose quartz for these pieces, but instead was inspired by her color choices of teal, pink, and purple. I wanted to use the paper beads she made and with the handmade lampwork focal, I added Czech glass in the colors that would compliment (I hope!) the various shaded of aqua and teal in the paper. The final pictures show what I came up with for Jenny’s special bead. 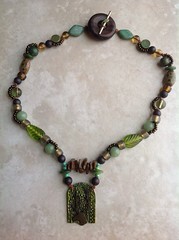 The necklace is about 36 inches long. With a necklace that long using all glass beads can get heavy; the paper beads and silk sari ribbons help keep the weight down, which is great. I hope she is pleased. I really love it and am thankful she sent it to me. Thank you for stopping by. Please visit the other BSBP participants. There are many talented people participating, so grab a cup of coffee or tea and settle in. You can go to Lori’s site and click on the names. 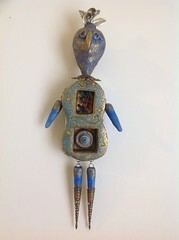 This entry was posted in Blog Hops, jewelry making and tagged BSBP9, Jenny Kyrlach, Lori Anderson, windbent, Wonder and Whimsy. Bookmark the permalink. Beautiful work – I love your colour combinations and design. Oh, how wonderful! I absolutely love, love, love what you made! That necklace is absolutely perfect (the focal looks like it was just made for it! ), the bracelet is lovely, and the earrings are so fun. I love the way you turned the paper beads on their sides for the earrings and the necklace focal… I have never thought to do that, and they add so much interest and depth to the pieces. How cool!! Thank you so much. I knew what I wanted to make right away when I saw what you sent. I appreciate your kindness and generosity. I’m going to add some of your Rose quartz and amethyst to my dreamcatcher for luck. Precious!! Lovely color palette too, so soft and gorgeous! Well done! You were right to focus on those colors, great combination! I love what you’ve made. 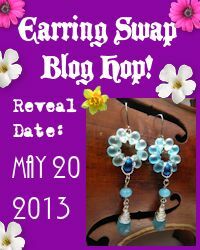 I really love the design of your earrings and the vintage posts you used. Great job on everything! Oh, wow! You have a real fairytale thing going on there – I love it! beautiful work! I especially love how you wrapped those earrings!! Gorgeous! Beautiful set Lennis! I love the colors (teal…of course). How nice to be sent the very first art bead she ever bought, I know that was special too. The colors are stunning in their softness. Such a beuatiful concept you came up with! I especially love the creative way you detailed the paper beads with the wire across top on the earrings. so elegant feminine designs! amazing! Hi Lennis, Your designs are delightful. I really like the color scheme that you chose. Using the paper beads sideways was very creative. Wonderful job using your swap beads. Wow, what creative thinking turning those beads on their side, that’s super!!! I love your colors, so soothing!!! wonderful job! I love how you pulled it all together! And those vintage earring findings are lovely. I’m going to have to look up the Knot Just Macrame flowers, too! Those were a private swap, but feel free to beg Sherri. 😛 She’s going to kill me. I love what you made – really like how you used the paper beads in the earrings – really wonderful! What an honor to receive such a special bead – you did it justice! Cool pieces. My favorites are the earrings. I love the color combinations. I plan to try pink and turquoise. Absolutely lovely Lennis! I really love the soft teal blues and pinks you used. You did Jenny’s special bead proud and made a lovely set! Good gravy, I just commented on your 2013 bead hop design by mistake. Moving on to the present…you’ve put together a nice collection of pieces. Your color palette is really lovely, and I like that you added silk sari ribbons to the necklace. I get your idea to make it lighter, and it does enhance your design. Bet you’ll enjoy wearing these. I love how you used those colors. The wrapping of the paper beads in your earrings is really clever. Well done! How clever to wrap those paper beads. And the colour pallet is sooo pretty. Lovely! I love everything about your designs, Lennis! Beautiful pieces, Lennis – I love your color choices. You always do such a great job of mixing textures and colors and materials – and that’s hard!! Oh Lennis!! You have done such a wonderful job with the beads you were given!! I adore the earrings – nice touch turning the paper beads sideways!! Thanks for your comments on my site! I need the encouragement when it comes to posting on my Blog! lol I really like what you designed with the beads you were sent. Nice work! really love how you made the earrings, the necklace looked wonderful and the bracelet wrap is inspirational. What gorgeous designs! I love the color scheme and how you can wear them all together or on their own. Your designs are very creative. i love the idea of the wrap around bracelet, and that it can double as a necklace. I like how everything you did works together as a set, too. Those colors are gorgeous. Lovely the soft spring colors. I love the wrap bracelet, like the layering. The earrings are great and I love how you turned the paper bead sideways, adds dimension. Love it all! I love the different way you wrapped the paper beads in the earrings! Very inventive! I love the texture of those earrings. They’ve got such a lovely gypsy/boho vibe. And the necklace is lovely too. Delightful! Wow! I love all the color. And the length of both the bracelet and necklace is very smart. I love being able to wear things in different ways! Beautiful job on all the pieces. Clever way to keep the necklace light too. Hi, yes, I’m still hopping😀 These pieces are beautiful – your designs fit the soft, dreamy colors perfectly. I also think the sideways paper beads are a great idea! Still hopping too! Thank you for visiting. Pretty, pretty, pretty! The colors you used are delicious, and I really like how you treated the paper beads in the earrings.